Co-operation is not a marginal phenomenon. More than 1.2 billion people, one in every six people on the planet, are members of any of the 3 million co-operatives in the world! They are strong and healthy: the Top 300 co-operatives and mutuals report a total turnover of 2.2 billion USD, according to the World Co-operative Monitor (2017). The International Co-operative Alliance is the apex organisation for co-operatives worldwide. Established in 1895 to advance the co-operative model, it represents 304 co-operative federations and organisations across 105 countries. The International Co-operative Alliance represents 1.2 billion people through its membership from the 2.6 million co-operatives worldwide. One in every six people on the planet are co-operators. Cooperatives Europe is the voice of cooperative enterprises in Europe, representing the International Co-operative Alliance. The regional office of the International Co-operative Alliance for the Americas. The regional office of the International Co-operative Alliance for Africa. The regional office of the International Co-operative Alliance for the Asia-Pacific. COBA is the industry advocate for Australia’s customer-owned banking sector. Instil is the peak professional body for mutual directors, managers and employees in Australia. Co-ops NSW is the peak body for co-operatives in NSW. Co-operatives WA is the peak body for co-operatives in WA. Employee Ownership Australia is an active voice for broad-based employee ownership and dynamic workplace participation in Australian and New Zealand companies. It works with government and individual companies to implement employee ownership or employee share plans. 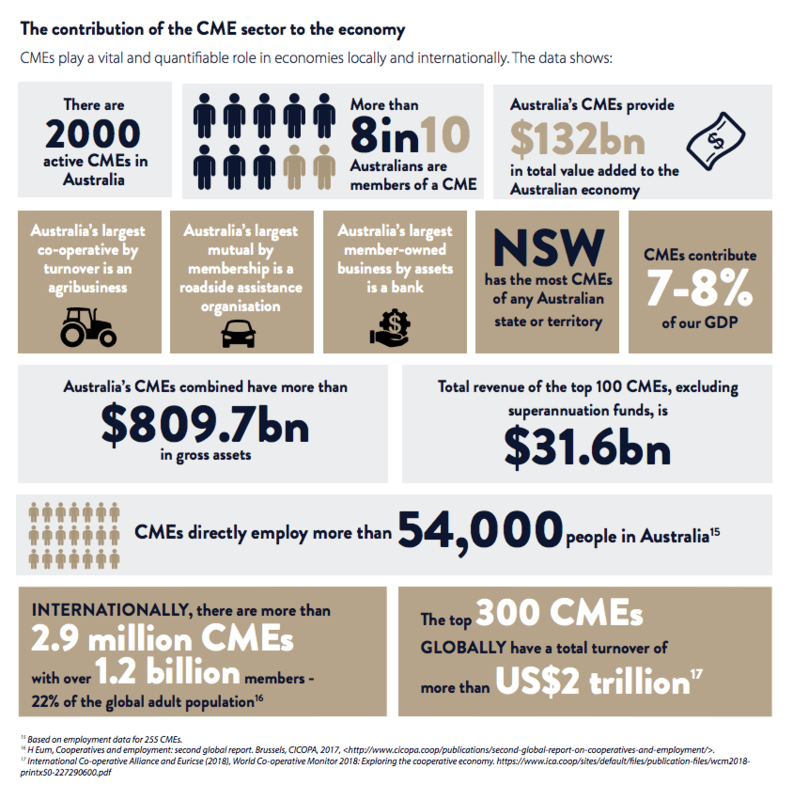 Co-operative and mutual enterprises are a significant contributor to the Australian economy. 8 in 10 Australians are members of at least one co-operative or mutual, with many being members of multiple entities (there are 28 million memberships in Australia). Total value added of the co-operative and mutual sector is $140 billion – 8.3% of GDP, and, excluding mutual super funds, total revenue of the top 100 co-operatives and mutuals is $30 billion. The sector provides core business support for over 174,000 businesses.